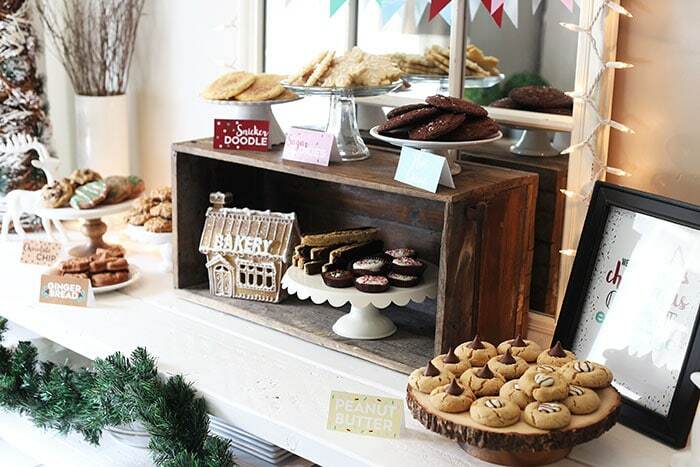 How to Host a Cookie Exchange party for the holidays that everyone will adore! From planning and invitations to recipes and decorations, there’s even FREE party printables below! 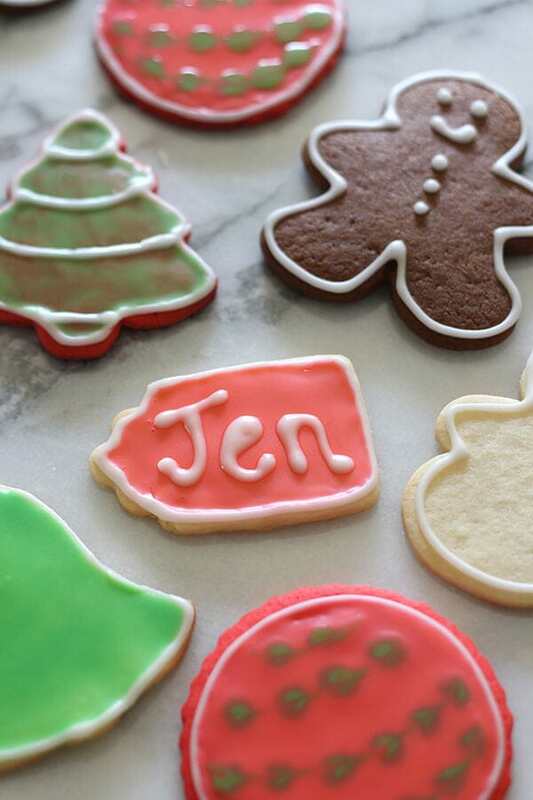 Hosting a Christmas cookie exchange party is the perfect fun way to get a group of girlfriends together during the busy holiday season. It’s more low key than the other holiday parties on your calendar, and you don’t have to worry about finding the perfect gift or holiday dress. Plus it’s a great excuse to get baking and sample festive cookies. It’s the perfect kind of party in my mind! 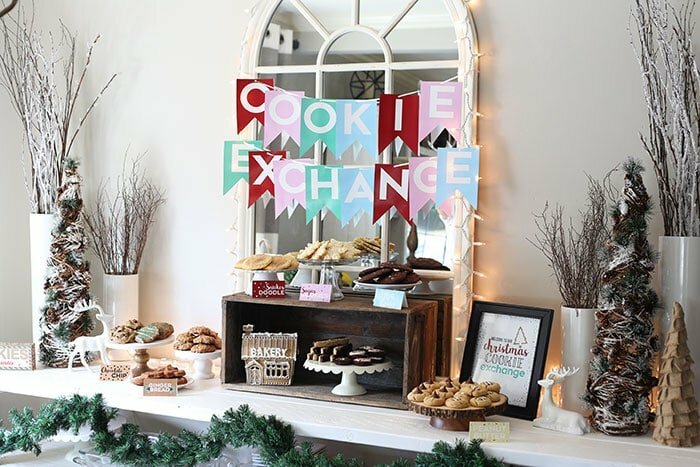 I’ve included tons of tips, advice, and inspiration in this post for you to host your own cookie swap. If you do host one, be sure to take some photos and tag me in them! Use #handletheheat on Instagram, or upload them to the Holiday Baking Bonanza Facebook community. 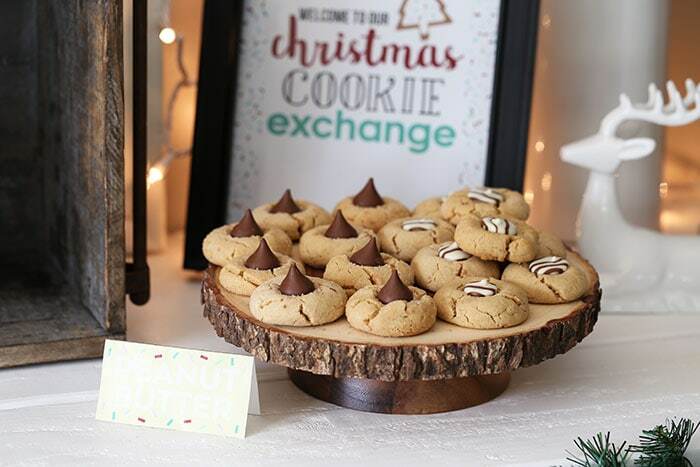 If you want to download the recipe title signs, invitations, and favor tags to use for your own cookie exchange party then just click here. 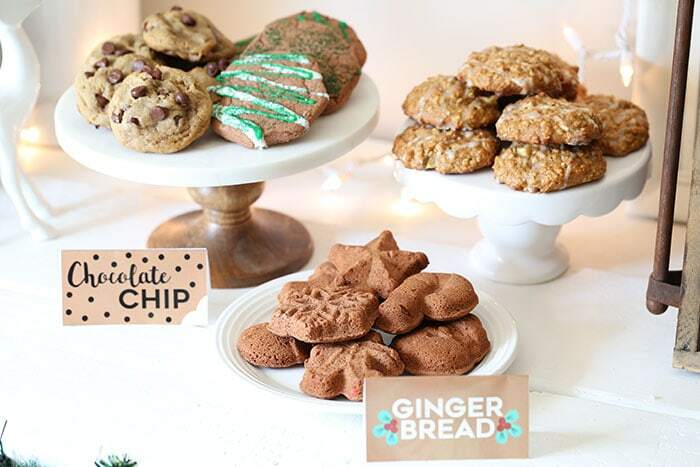 The full party printable kit with the additional banner, recipe cards, decorative signs, taste testing cards, and more is part of your purchase of Tessa’s Christmas Cookies. • How many people do you want to invite? How much room do you have? Who would be interested? • Set a date & send invitations far enough in advance. This is a busy season so you want to be sure your friends and family can make it! • How many cookies should each guest bring? Remember, the party is about tasting and sampling the cookies but also about each guest bringing some home to enjoy with the rest of their family later. 2 dozen per guest is a good minimum so everyone has a few to bring home. 6 dozen is a good maximum if everyone wants lots of cookies to take home. • Ask ahead for any allergies among your guests so you can make accommodations. 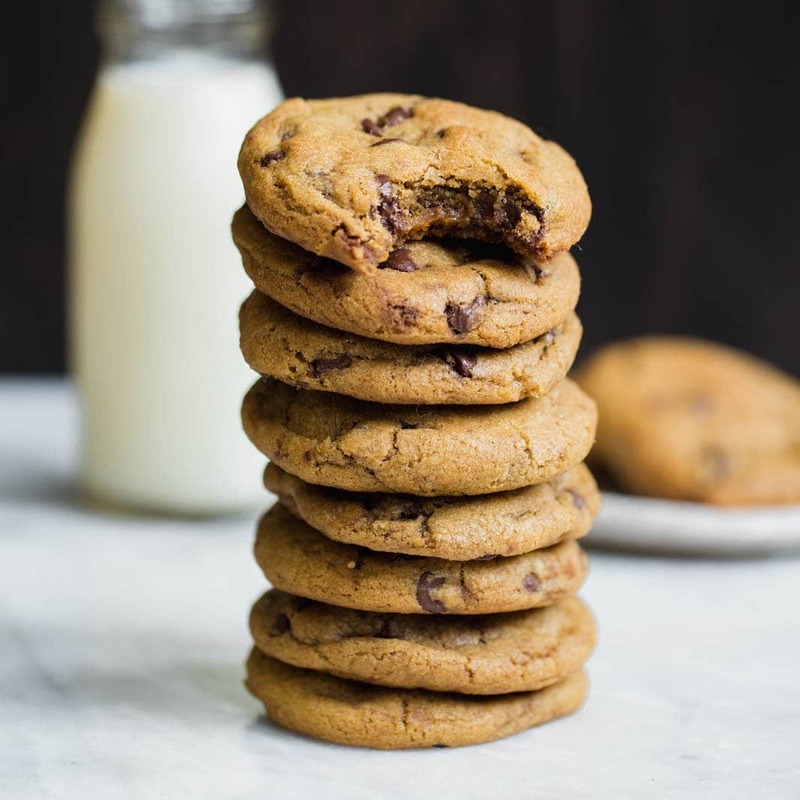 Check out my Ultimate Guide to Chocolate Chip Cookies Part 3 to see my experiments baking gluten-free, refined sugar-free, and egg-free cookies! • Rules? 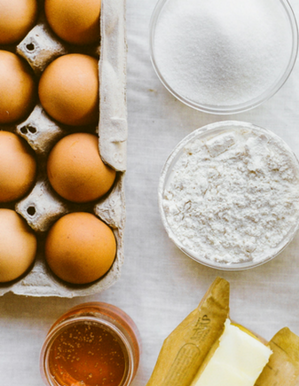 Do you want to ask everyone to make something from scratch, instead of using a mix or buying from a bakery? Dress code? Is Christmas attire encouraged? Don’t leave your guests confused and wondering! 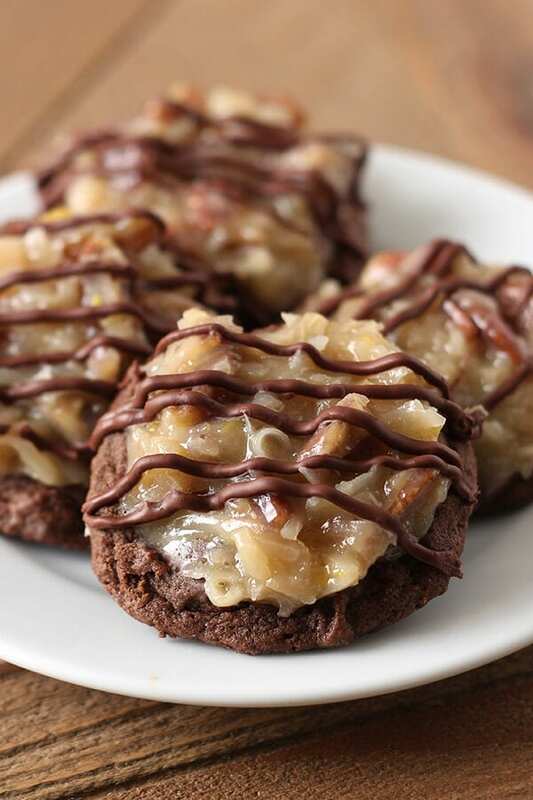 • I have tons of cookie recipes in my library here. • The BEST place to get my all-time favorite cookie recipes is inside my eBook, Tessa’s Christmas Cookies. 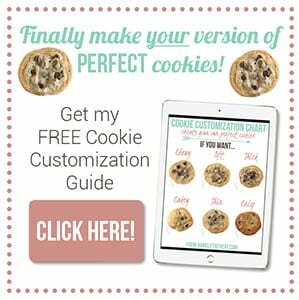 • For directions on how to make cookies (and tons of other recipes) ahead of time, check out my free Make Ahead Baking Guide here. 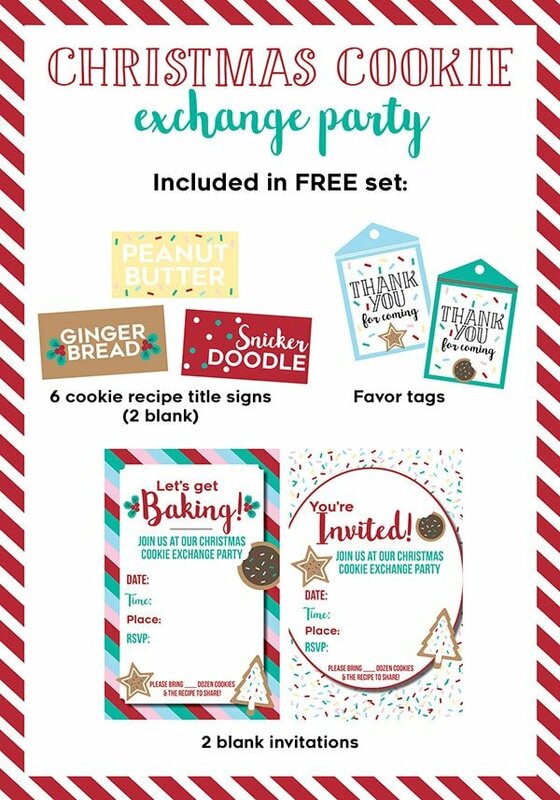 • Download my pack of three FREE Cookie Exchange printables to use during your party HERE. The full kit comes with Tessa’s Christmas Cookies. • I love to buy festive decorations at Hobby Lobby when they’re 40% off, or at Michael’s when they’re on sale or offering coupons. Garland, lights, and figurines should do the trick! That adorable glittery “Bakery” gingerbread house below is from Hobby Lobby, I’m obsessed with it! • Use the labels in my free kit or make your own so that everyone knows which cookie is which. If you’re adding a competition / taste test element to the mix, then be sure to write the name of who made the cookies as well. • Don’t forget about drinks! Cold milk, eggnog, hot cocoa, coffee, and tea are all great ideas. Maybe even wine or spiked eggnog, if it’s that kind of group! • You might consider offering a few savory appetizers and a vegetable platter to keep things balanced. • Make a festive and fun Spotify or iTunes playlist to keep energy up! • Many cookie exchanges have a taste test competition wrapped in! 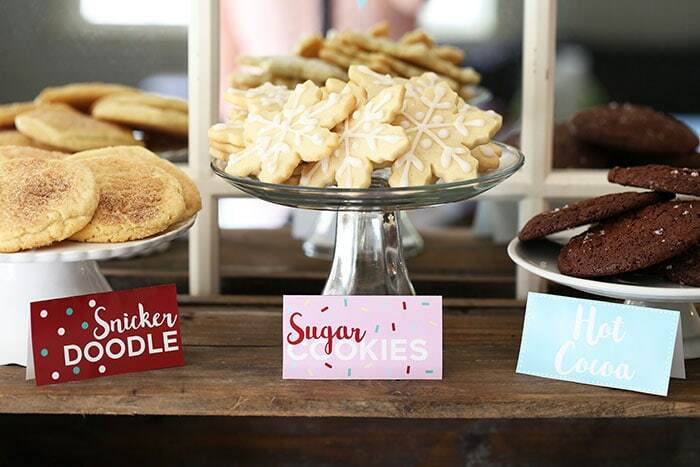 Give your guests taste test ballots (those are in the full party kit) so they can select their favorite cookies according to judging categories. • Consider offering fun prizes for the best cookies: cookbooks, cookie jar, baking equipment, oven mitts, an apron, etc. • Really capture the reason for the season and ask guests to bring gently used winter clothes or non-perishable food items to donate to a shelter or food bank. • You can ask your guests to bring their own take away containers, or you can supply them yourself. 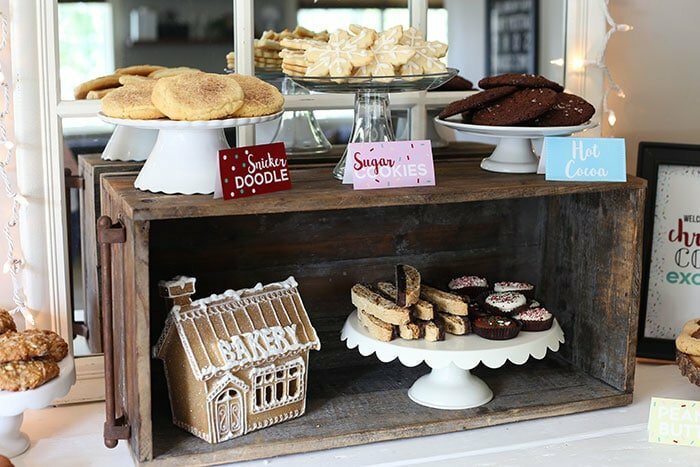 • Set up a packing and favor station so guests can box up their favorite cookies. 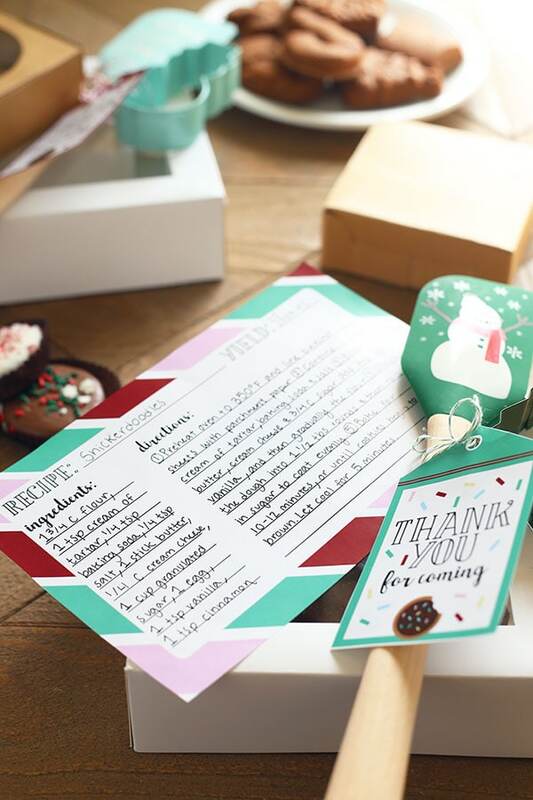 Encourage people to bring print outs of the recipe they baked, or write them out on recipe cards for anyone who wants to recreate them at home. • Party favors are always appreciated! 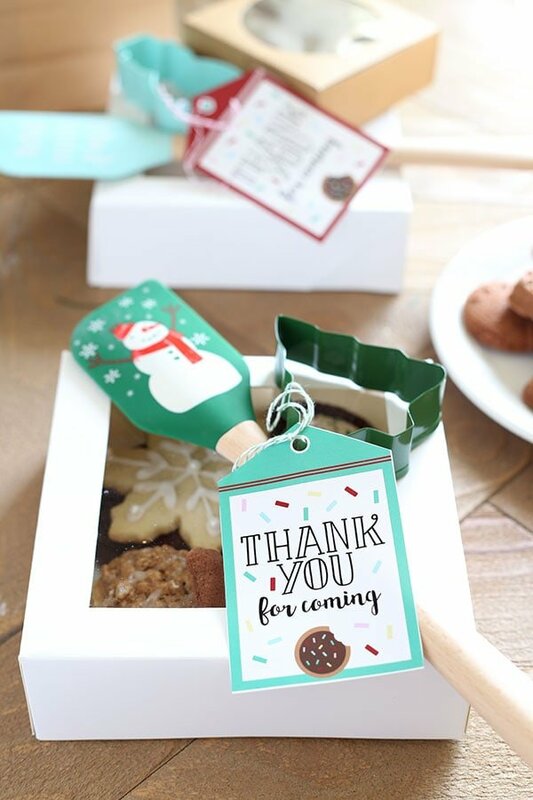 I love to tie together a festive cookie cutter and spatula with a sweet note. You can find these cheaply at Target, Hobby Lobby, Michael’s, Home Goods, etc. I hope this becomes an annual tradition with your group of friends! Let me know in the comments below if you’ve ever hosted a cookie exchange, and what your tips are! 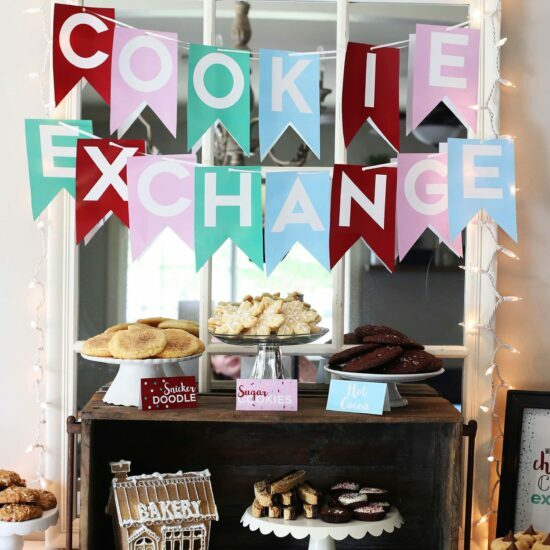 An optional idea: a cookie baking/ exchange party. I attended one with kids involved. The hostess supplied basic ingredients: butter flour, sugar, eggs. Guests brought cookie sheets, a favorite recipe & any special ingredients. It was a lot of fun & guests took home a variety of fresh baked cookies. How do you divide up the cookies amongst the guests? 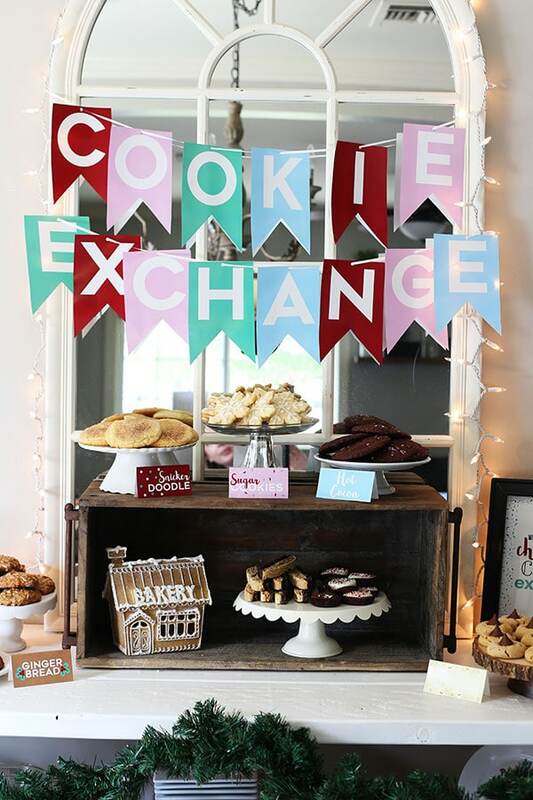 I love your set up for the cookie exchange party and am trying to download your free printable for an exchange I am hosting next week. I have put in my email twice and haven’t received any confirmation yet. Any help you could give me would be much appreciated! Hi Angie, from my end I can see the confirmation email was delivered, but not opened. It probably got lost in spam or the promotions tab, so I’d definitely check there! Thanks! Still no email on my end in any folder but I’ll keep checking. I love everything in your blog Tessa! More power! I have hosted a cookie swap party for the last 3 yrs. I’ve had up to 20 people and as few as 9 or 10. My guests usually pack up 6 cookies per pkg with one pkg per guests. Then we have extras for sampling. It is a fun Mom’s Night Out. Most of us have kids that are of similar age. I usually make some finger food apps and homemade sangria. Friends bring wine or other hoodies to share. I found holiday themed bags that the guests bring each year. They put one pkg if cookies in each themed bag and take it home at the end if the night. Then they have an assortment of cookies for their family or to bring to other holiday gatherings. These are so cute. I have received the conformation email and the free hosting a party download, but not one that contains the printable items. never mind. just received the email. thank you. My party is this coming Sunday (Dec. 3) – I do mine as more of a “cookie sampling and recipe exchange.” I have guests bring 3 dozen cookies plus 12 copies of their recipes. (I will up these numbers if my number of guests goes beyond 12.) We sample all the cookies, play a few fun little games, give away some prizes, and then everyone takes home a packet of all the recipes PLUS we go around the table each with a container and take home the rest of the cookies. 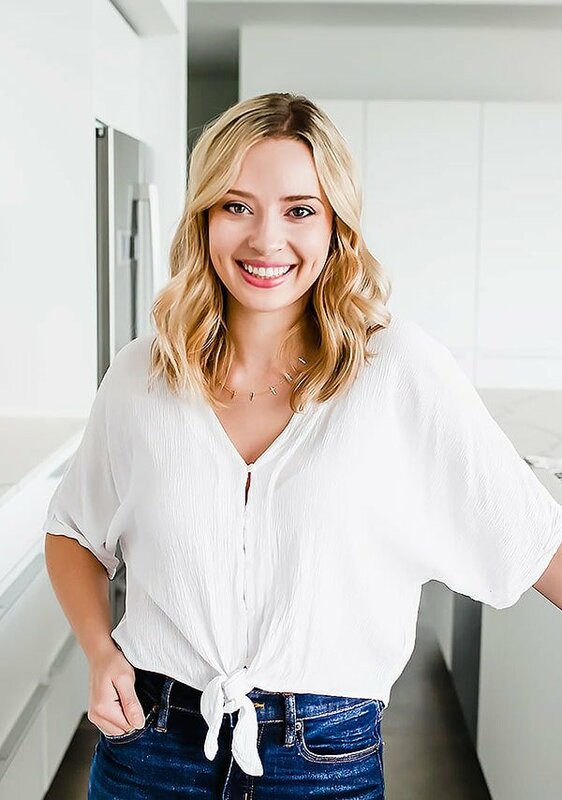 I’ve hosted this party twice, both times in early December – early enough so guests still have time to bake their favorite recipes in time for Christmas! I love everything about this post. I am hosting a cookie exchange and this post inspired it! I googled cookie exchange and this was the first website that came up. So thank you for the inspiration! I want to copy your crate idea. What size crate is that and where did you purchase? Thank you! Grｅat іnformation. Lucky mе Ӏ found ʏоur site by accident (stumbleupon). I’ｖe bookmarked it fߋr later!